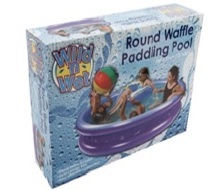 waffle pool for children A family sized round paddling pool for summer fun. Durable, easy to inflate and stable. 20 inches deep, and with blue interior. Includes water outlet for easy emptying.